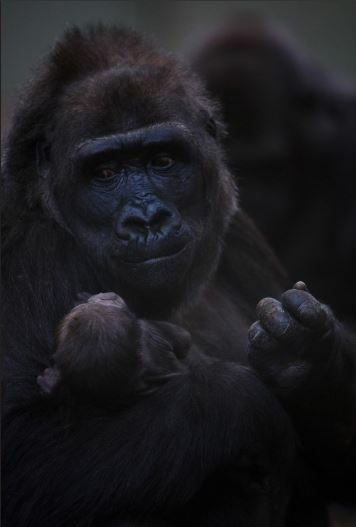 Dublin Zoo have announced the birth of an adorable western lowland gorilla to first-time mother Kafi and father Bangui on April the 1st. The newborn is the first offspring of Bangui since his arrival in Dublin Zoo. Bangui was welcomed into the zoo last year after the death of the previous alpha-male silver-back gorilla, Harry. He was quickly accepted as the successor of the alpha-male status. The gender of the newborn has not yet been identified as they are too wrapped up in their mothers arms for the zoo keepers to determine whether the baby is a boy or a girl. "Kafi is doing a fantastic job so far as a first-time mother, keeping the young baby physically close in these crucial early stages. Bangui is proving to be an attentive father and at night has been sleeping close to Kafi and the baby. Kafi seems comfortable and at ease and we expect her to mix with the rest of the gorilla troop very soon." The birth has been celebrated across social media, as any new arrival in Dublin zoo would be. If this doesn't get you excited to visit the zoo, I don't know what will. Book your next visit here.